Perfection. 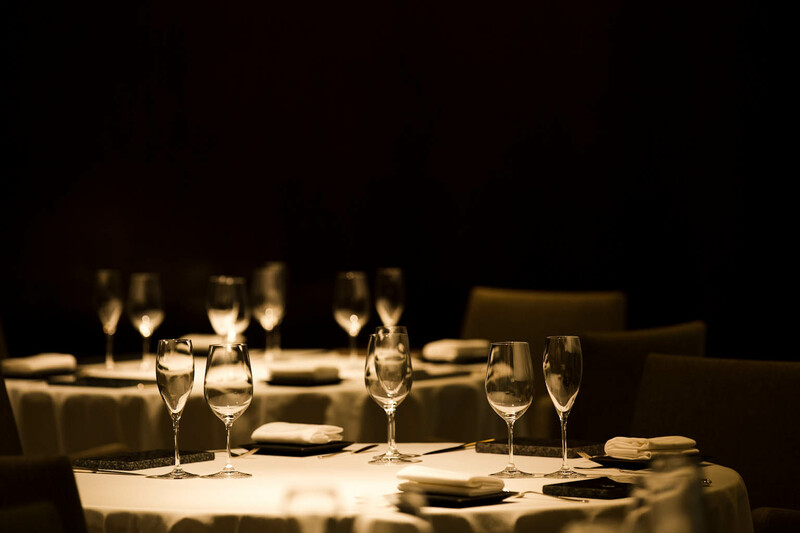 Constantly creative cuisine and impeccable service – true to its name, this is the quintessential fine dining experience. 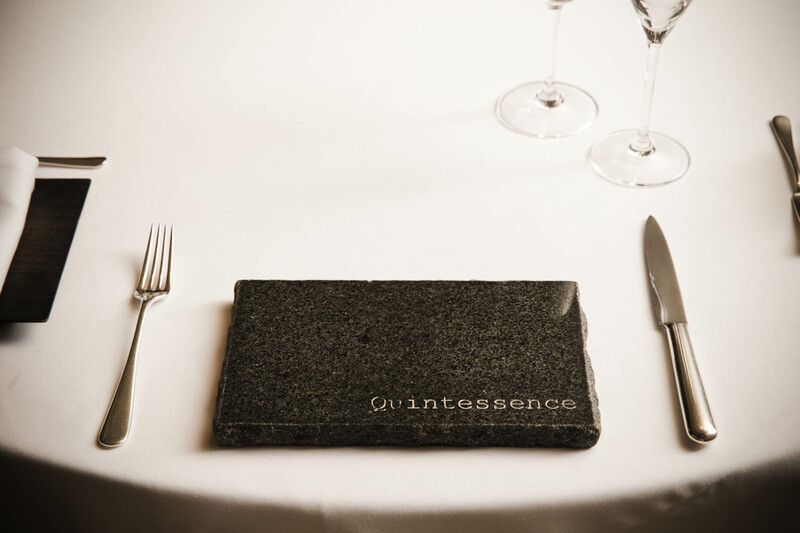 Dedication and meticulous attention to detail have earned Quintessence three Michelin stars for ten years in a row. The calm and measured chef channels all his passion and emotions into cuisine that resounds deeply with so many that the opportunity to dine here is almost impossible to come by. The streets of Gotenyama, Shinagawa are lined with large, stately buildings, and while this is not Japan’s national treasury, the heavy, glossy doors, reminiscent of those on a bank vault, certainly reveal treasure within. The front entrance is showered in light by an Ingo Maurer design called Zettel’z. Wires sprouting out of this ever-evolving work of art hold paper messages and musings by the artist, the chef, and guests. On the table, silicon cubes exhibit herbs, spices and other items found and foraged by the artist, and later added to by the chef. Already you can see the theme is one of evolving creativity. Smooth wooden walls contrast with fabric ones, with texture like lines in the sand. A long mirror highlights a reddish wooden wall, and shelves of decanters and Riedel varietal wine glasses add sparkle to the warming tones. Fine Cutipol flatware matches the elegant and refined nature of the cuisine. The tableware is a collection of Japanese and western styles in wood, ceramic and metal. Round with soft, thin curved edges, or thick ceramic pieces with sharp, angled sides, most of the pieces are original, designed by the chef in collaboration with preferred kilns around Japan. Generous chairs loosely embrace diners who sit down to find an engraved stone centered at their place. If you look closely, every stone is different. With slightly different colors and textures, the stones from Japan, Iceland, New Zealand, the US, and many other places around the world give grounding and set the stage for the meal about to unfold before you. Quintessence cuisine is incredible. It’s flawless. This pinnacle of contemporary cuisine, with strong French influences, is based on a philosophy of allowing the product to guide the chef in terms of cooking method and flavor combinations. Intricate flavors are highlighted with just the right amount of seasoning, and proteins go through countless iterations in and out of the oven, to achieve the perfect velvety, succulent texture. Add to this a sense of poetry and a touch of humor, and the chef’s heart and soul is laid out for you in each dish. Dinner is a 13-dish chef’s degustation showcasing the best fresh produce every day. Even if you have dined here before, you will find almost every dish to be creative and new. That’s because Chef Kishida is dedicated to giving his guests a unique experience every time, certain that the elements of surprise and ingenuity enhance the delicious flavors and leave guests with an unforgettable, deep impression. While this need for constant creativity can be challenging, Kishida says the products are his source of inspiration. The pressure of finding the best way to present them can be emotional, but that translates into a moving experience for diners. Knowing every guest’s dietary restrictions in advance also enables Kishida to serve the best each day. He doesn’t take ideas from other chefs and is never swayed by trends. That feels awkward and unnatural – not a true expression of himself. 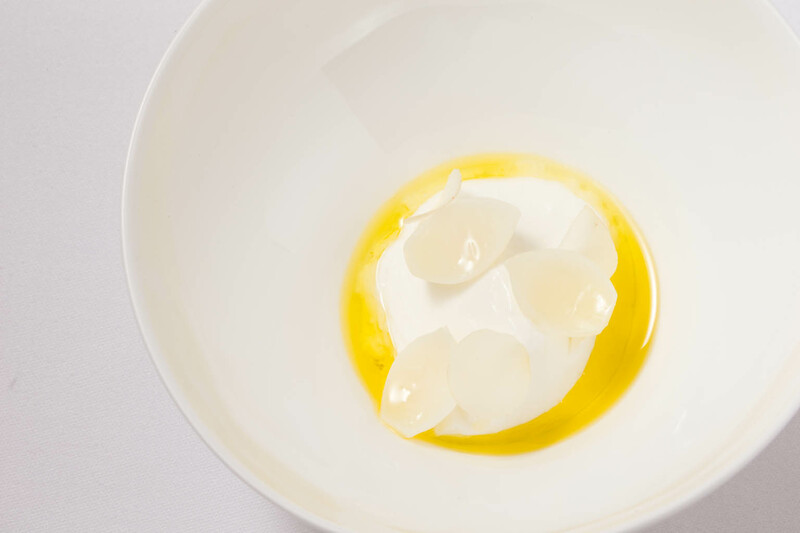 Chef Kishida’s signature dish, a savory goat’s milk bavarois, arrives early in your course. This purposefully simple dish was designed to showcase two key ingredients – olive oil and salt. Typically used as seasonings, and found in dishes throughout the course, the bavarois is a chance to make these flavors shine. It is silky smooth and strikingly white, topped with the creamy pearl-like rounds of lily bulb and macadamia nuts, with an accent of color from the yellowy green tones of olive oil. Now you have been introduced to the main seasonings, it’s time to let them do their magic on fresh seasonal ingredients throughout the scrumptiously generous course that follows. Grilled fish, with skin so crisp yet flesh so tender, is almost rare at the core. 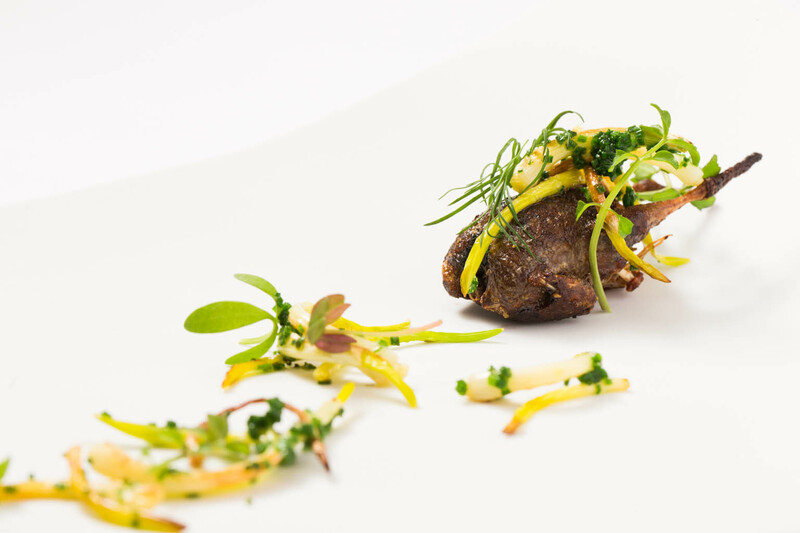 Venison, appearing raw despite being perfectly heated through, is filled with juices and umami – not a drop of flavor has been allowed to escape. The amazing flavors continue through multiple dessert courses prepared in a kitchen with no pâtissier. The star is undoubtedly an ice cream dish that will tantalize your taste buds every time you dine at Quintessence. Homemade from baked meringue, of which the chef has fond memories from France, it is prepared just before serving. With a sensation like no other in the world, and no garnishes and adornments, you can savor every textured and flavorful bite of this unbelievably delicious ice cream. Whether they are farmed, foraged, fished or hunted, Kishida only uses the best seasonal items. Fresh ingredients are delivered from all over the world every day. Farm-fresh goat’s milk from Hokkaido, sea salt from Brittany, and olive oil from France are the key components in the signature bavarois. Meats are roasted low and slow resulting in tender morsels filled with rich natural juices. Dependent on the products lovingly made by others, the chef’s role is about respect for that process and the outcome. Thus, the chefs in the kitchen at Quintessence address each ingredient every day and assess how best to showcase its flavors. When you serve the same dishes repeatedly, it can become a task. But when you have a conversation with the ingredients, the ideal cooking method and best pairings become clear. The journey of creation is stimulating for the chef and sheer pleasure for the diner. The hunting season is a favorite time of year for Chef Kishida. Charmed by the talent of the hunters, he produces stunning dishes such as roasted wild baby bird hunted in Gifu Prefecture. Despite its diminutive size, the roasted bird is packed with wild, condensed flavor that you can devour bones and all, and is presented simply with delicate seasonal vegetables and chive shoots. Originally from Aichi Prefecture, and now 42 years old, Shuzo Kishida is clearly passionate about his life and food. Happy to talk, but not so forthcoming with emotion, he seems to channel all his emotions into his food. As a child, he loved his mother’s cooking, but was often charged with cooking family meals while both parents worked. Clearly talented and drawn to French cuisine, he entered culinary school, hoping at the end of it to work for the chef at La Mer in the Shima Kanko Hotel, Mie Prefecture. His goal was realized, but solid experience at La Mer and later in Tokyo was not enough to satiate Kishida’s passion, so he took off for France. Living in the relatively rough suburbs of Paris, his eyes were opened to a whole other world, but rather than being intimidated he was stimulated. Amid the ups and downs, France was a lot of fun. Kishida learned the language while juggling multiple jobs at high-end restaurants, many with Michelin stars. He was particularly taken by a restaurant not long opened that was gaining a great deal of attention among French gourmands – L’Astrance, in Paris’ 16th arrondissement. Visiting every so often, Kishida implored them each time to hire him, and finally on about the fourth occasion, Chef Pascal Barbot agreed. 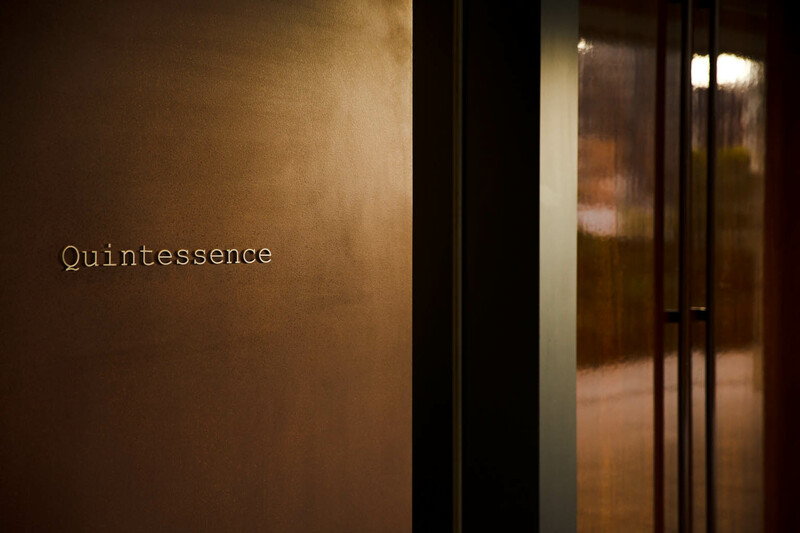 At L’Astrance, Kishida was so surprised by the freedom offered by modern French. His creativity overflowed when given the opportunity to incorporate the spirit of classical French into contemporary cuisine. Ultimately rising to Sous Chef, his experiences were so eye-opening that they shaped what Kishida can now call his own cuisine. His recipe for success is based on three ideas: respect the product, perfect the cooking process, and pay attention to detail in seasoning. 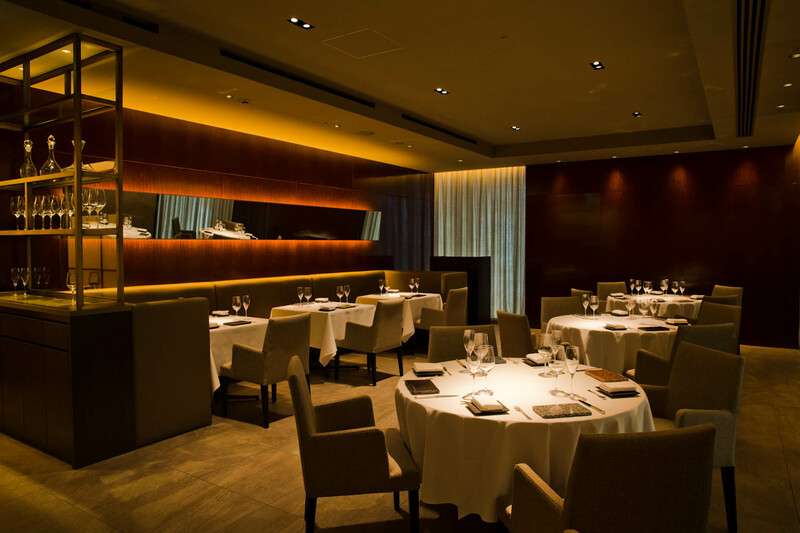 Returning to Japan, Kishida initially opened Quintessence in the high-end neighborhood of Shirokane in 2006, earning three Michelin stars after just one year. In 2014, the restaurant moved to the present larger and more grand location, which the chef simply describes as “ideal”. His dedication to quality and his message mean that Quintessence does not operate if Chef Kishida is not there. In the 11 years since opening, Kishida has never missed a day. He takes care of himself, working out at the gym, taking supplements, and wearing a mask in crowded places. If he wants to travel or participate in events, he makes sure to schedule those items more than two months in advance and closes the restaurant during that period. Keenly aware of his identity, he loves his own cuisine, and feels very strongly that the chef’s presence is an indication of his sincerity. Chef Kishida plans to maintain the style he has established, ensuring the customers’ needs always come first. He chooses not to expand or jump into new businesses, but he is always happy to support chefs who have properly graduated through his kitchen, dining at their restaurants and assisting however he can. He believes it is all about give and give, because even those who pursue other opportunities always come back in some form, and that will always be good for the Quintessence brand. 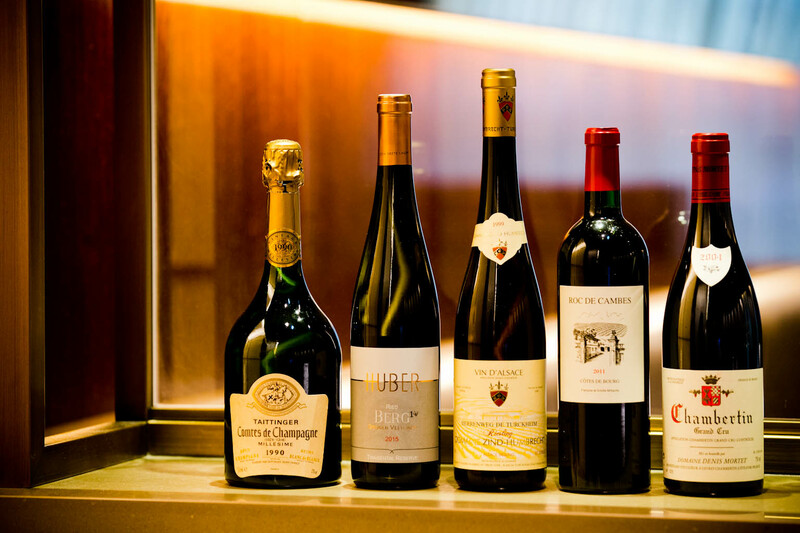 Quintessence’s wine collection contains a staggering 4,000 bottles, more than ninety percent of which is French. Many tell stories of personal interactions and special memories from Chef Kishida’s time in France. Pairings for the chef’s degustation is best left in the hands of the sommeliers. And there is no shortage of them at Quintessence – every staff member is a trained sommelier. Because the food changes every day, wine selection can be very difficult. 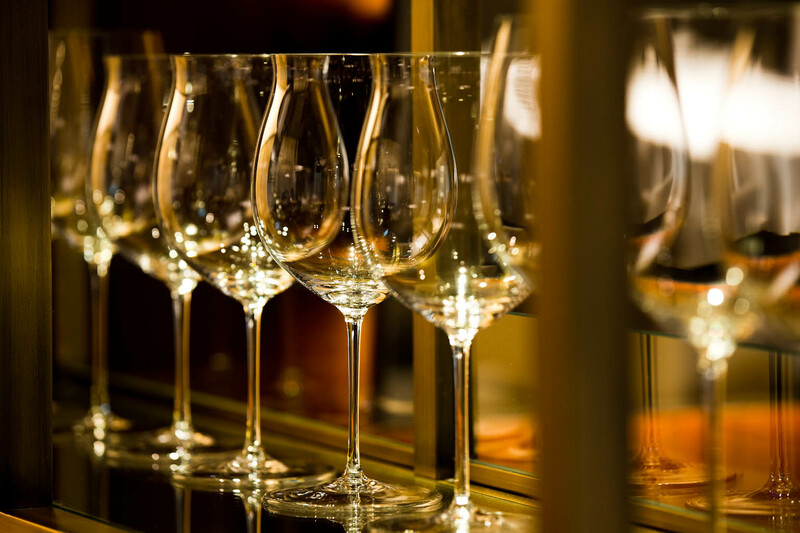 But the team at Quintessence, never shying away from a challenge, composes exquisite wine degustation courses and finds the perfect glass to enhance the aroma and taste sensation of every wine. With lighter flavors and no heavy sauces, the elegant cuisine is often paired with wines from Bourgogne, but the savory bavarois signature dish is usually paired with an Austrian Grüner Veltliner. And in contrast to recent trends, you will not find any Japanese sake here. It simply does not fit.